1. Many people have questions about exactly where bhava and kamma beeja are “located” or “stored”. This is a bit hard to explain simply because we have no “feel” for mind phenomena. We have a hard time connecting with anything that is not discernible to our five physical senses; we need to see, hear, taste, smell, or touch to feel confident that “something is real”. Yet, if one makes an effort, it is quite possible to get a good idea what these are. Actually, modern science helps here too. If someone is serious about figuring this out, I would really recommend reading the posts, “Difference between a Wish and a Determination (Paramita)” and, especially, “Recent Evidence for Unbroken Memory Records (HSAM)” first. 2. From the second post above, It is clear that complete records of ALL our past activities during even just this life will be impossible to be “stored” in the neurons in the brain. There are people who can remember EVERYTHING that happened to them over many years, in minute detail. The Buddha said those memories are in manō lōka (“nāma thalaya” in Sinhala) which could be called the “mind plane”; those memories in the manō lōka come to our mind via mana indriya in the brain: “Indriyakathā” (no details are given in this link). It is not storage in a physical device like a tape. Manō lōka is devoid of any material things, it is all “nāma“. It can be thought of as in a “different dimension”; new theories in physics say our universe has dimensions that we cannot “see”. The closest analogy we have to the mind plane is the “dream world”. When we dream, we can “hear”, “see” and “do” things but it is all “nāma“. When we “play back” memories, it is somewhat like seeing a dream. We can recall our memories (whatever we can remember) very quickly. If we have a strong memory of some event, even from many years ago, we can recall it in our mind instantaneously. We just think about it and we can “see” it play back with sounds and the background just like it happened. Our minds can connect to the “mind plane” and recall things without a delay; see, “Amazingly Fast Time Evolution of a Thought (Citta)“. In this “recall process”, the brain acts the intermediary; brain (actually the mana indriya in the brain) acts like a “transmitter” and a “receiver” in communications with the mind plane. As we get old, the brain gets weaker and thus the “recall power” gets diminished. Meditation (especially dhamma vicaya or contemplation on dhamma concepts) helps keep the brain healthy. It is just that some (few) people are born with the ability to recall ANYTHING from this life, as that post on memory records (HSAM) described. This ability can be also cultivated by developing abhinna powers as I discussed in another post. 3. When we “wish or hope for something” that thought will have a record of that in the manō lōka too; later, we can recall that we made such a “wish”. While a “nāmagotta” (I have written this as nāmagotta too) is just a record, a wish has certain energy in it, but if not cultivated by further thinking and doing things relevant to that wish, that energy will soon fade away. When we make a “determination” that has more “javana power” than just a “wish” and such records are stronger, i.e., they do not fade away quickly. Our wishes, determinations, cravings for things, future plans, etc are all sankhara (moral and immoral). Some of them are strong and become abhisankhara. They all lead to “kamma beeja (seeds)” or varying strengths. Some are strong enough to lead to rebirths; others bring vipaka during a lifetime. They can be good or bad. Thus “dhammo ha vé rakkati dhammacari” or “dhamma will guide those who live according to dhamma” applies to both “good” and “bad” dhamma: Moral people will be guided upwards, and immoral people will be guided downward. Mother nature is neutral; each one chooses which way to proceed. However, the results are ALWAYS according to kamma or actions; see, “Paticca Samuppada – “Pati+ichcha”+”Sama+uppäda“. 4. Therefore, records of both past “nāmagotta” and our mind activities associated with “future plans” (which are same as “kamma beeja“) are in the mind plane. The difference is that past “nāmagotta” are permanent and have no energy to do anything, while the records of “future plans” are in flux and can get stronger or fade away. However, the record for even a determination (whether or not fulfilled yet) will be recorded in the mind plane, because just after passing away it is in the past and that thought becomes a record in “nāmagotta“. For example, if one makes a determination to kill another person, that thought will be recorded in the mind plane as a nāmagotta. In addition, there will be a tentative record of a “kamma beeja” associated with the future too. The more he thinks and plans, the stronger the “kamma beeja” gets. If, somehow he comes to his senses and discard that thought the “future” imprint (and associated energy) will fade away, and there will not be a “kamma beeja” associated with it anymore. When one is thinking about a good or a bad act, it has not acquired the “full kammic potential”, i.e., it is said that the “kamma patha” is not complete. If that person ended up killing the other person, then the “kamma patha” is complete and there will be a “kamma beeja” established that will be there up to 91 maha kalpas (a maha kalpa is the lifetime of a universe, roughly 30 billion years). If that strong “kamma beeja” brings about a bad rebirth thus depleting its energy, at that point that result (new birth) now becomes a “nāmagotta” or just a record. This is a simple overview of what happens; if one contemplates on it, one should be able to get an idea of the concept. 5. Depending on the nature of the deed, a “kamma beeja” may be in different types of “bins”, called “kamma bhava“. For example, if someone cultivates rupa jhanas, then the associated kamma beeja will be in the “rupaloka bhava” or simply, “rupa bhava“. If another cultivates arupa jhanas (one of the highest four jhanas), then the associated kamma beeja will be in “arupa bhava” and when that kamma beeja releases its energy, he/she will be born in the arupa lōka. All other (abhi)sankhara will bring about vipaka in the kama lōka (deva, human realms and the four lowest realms). We will discuss this in more detail in the next post. To summarize: When we do a kamma (abhisankhara), we generate a certain energy called a kamma beeja that will be “stored” in the appropriate “bhava” in the mind plane. When the vipaka associated with a kamma beeja is experienced, that energy is spent and only a record of that (nāmagotta) survives in the mind plane. 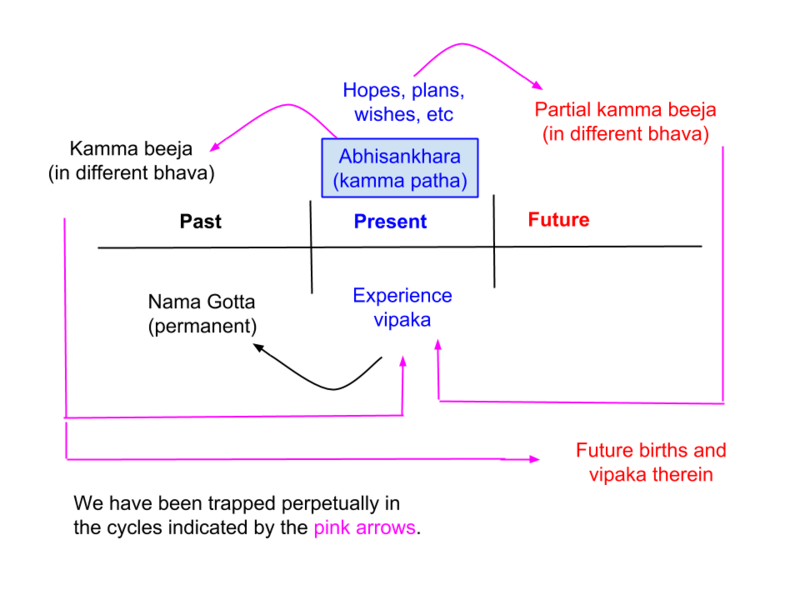 As the chart shows, we make “kamma beeja” of varying strengths in various “bhava” during a lifetime that will lead to more rebirths as well as uncountable kamma vipaka during those rebirths. 6. Another important point is that there are two ways to “bypass” a strong “kamma beeja” associated with such a “kamma patha” of, say, killing of a human. He could realize the enormity of the deed, ask for forgiveness in his mind (genuinely), and start engaging in moral deeds, then he may be able to “wear out” some of the energy of that “kamma beeja“. More importantly, if he can cultivate Ariya metta bhavana, he may be able to wear it out completely (unless it is one of the anantariya kamma, like killing a parent); see, “5. Ariya Metta Bhavana“. The other way is of course to attain the Arahanthood. Unless that particular “kamma seed” brings about the vipaka before that Arahant passes away, it will become null at the death of the Arahant. Furthermore, if that “kamma seed” is not that strong and does not bring vipaka within 91 maha kalpas, then it will become null and void too. Only the “nāmagotta” are permanent, “kamma beeja” are waiting for appropriate conditions to bring vipaka and are changing with time. However, “nāmagotta” are just records, but “kamma beeja” have energy to bring about results (vipäka). 7. There are special cases where a “kamma beeja” (and associated “kamma bhava“) WILL NOT change. An anantariya kamma establishes a “kamma beeja” (and “kamma bhava“) that WILL bring about vipaka without exception: “Bhava paccaya jathi” WILL happen in that case; see, “What Does “Paccaya” Mean in Paticca Samuppada?“. On the “moral side”, all stages of Nibbana can be thought of as “anatariya kamma“. For example, when one attains the Sotapanna stage, he/she WILL be born only according to that “Ariya bhava” or that special kammic energy; thus a rebirth in the lowest four realms WILL NOT happen. Another interesting point is that when a Bodhisattva cultivates “paramita” to become a Buddha, what he is doing is to establish a very strong “kamma beeja” over innumerable lives. But at some point that “kamma beeja” gets fully established and at that point the Bodhisattva gets “niyata vivarana” (confirmation of attaining the Buddhahood or “Buddha bhava“) from a Buddha at that time. The above concepts are looked at from a bit different perspective in, “Memory, Brain, Mind, Nama Loka, Kamma Bhava, Kamma Vipaka“. Of course, they are consistent! In the next post we will discuss how different types of “bhava” are fueled by our actions: “Gathi and Bhava – Many Varieties“, ………..